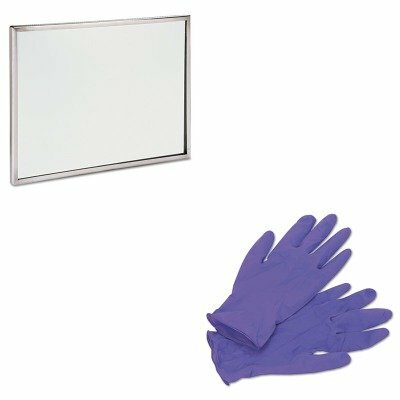 View More In Gloves - Page 4.
lt;stronggt;SEEFR1824lt;/stronggt;lt;BR/gt;See-All Industries Wall/Lavatory Mirrorlt;BR/gt;Flat mirror with stainless steel frame. Perfect for commercial areas as well as restrooms and locker rooms where a true view is required. Horizontal or vertical mount. Width: 26amp;quot; Height: 18amp;quot;.lt;BR/gt;lt;BR/gt;lt;stronggt;KIM55082lt;/stronggt;lt;BR/gt;See-All Industries Wall/Lavatory Mirrorlt;BR/gt;Get a good grip and an excellent fit. Textured fingertips allow you to work with ease and confidence. Easy-to-don beaded cuffs provide greater strength and durability. Nitrile, synthetic rubber construction eliminates the possibility of latex-oriented allergic reactions. Long, 9 1/2-inch ambidextrous design. Style: Disposable Wrist Style: Beaded Cuff Materials: Nitrile. If you have any questions about this product by SeeAll, contact us by completing and submitting the form below. If you are looking for a specif part number, please include it with your message.